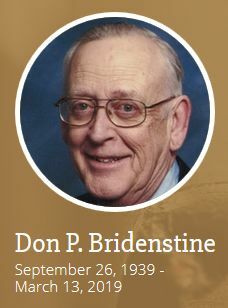 Don P. Bridenstine, 79, of Farmington, passed away March 13, 2019. Don was born September 26, 1939, in Detroit, to the late Louis and Mary Ellen (O’Keefe) Bridenstine. He married Eileen D. (Fryz) on September 8, 1962 at St. Lawrence Catholic Church in Detroit. A 1957 U of D Jesuit High School graduate, Don furthered his studies at the University of Notre Dame, the University of Michigan Graduate School of Business and the University of Detroit, earning degrees in economics as well as his MBA. Don enjoyed a lengthy career in the automotive industry, establishing himself in business in 1962, and retired as President of Liberty Chevrolet-Cadillac, Inc., Bloomsburg, PA, in 1998. Don’s numerous memberships include his church, Our Lady of Sorrows, Farmington, and formerly St. Columba, Bloomsburg, PA, and Gesu Catholic Church, Detroit, the Knights of Columbus (both Monaghan and St. Francis Councils), Rotary Club (Rotarian of the Year), Bloomsburg University Husky Club and the Creative Advertising Club of Detroit. Surviving are his wife of 56 years, Eileen; children, Dan (Karen), Mark (Michelle), Paul (Anne), Lisa (Timothy) Burkhart and Matthew (William Bulger); siblings, James (Sheila) Bridenstine and Ann Zann; 9 grandchildren; and 3 great grandsons. Sadly, Don was preceded in death by brothers, T. Patrick, Louis Jr. (Lucia), and William (Joan Avery). The family will receive guests at the funeral home on Monday, March 18th, from 3-8pm, with 7 pm prayers, including a rosary. Don’s funeral mass will be celebrated Tuesday morning, March 19th, at 11:30 am (in state at 11 am) at Our Lady of Sorrows Catholic Church, 23615 Power Rd., Farmington. Immediately following the mass, Don's family will host a lunch reception for friends at the Huron River Hunting and Fishing Club, 22575 Farmington Rd., Farmington, MI. Private interment will follow at Mt. Olivet Cemetery, Detroit. Memorial contributions suggested to the Society of St. Vincent DePaul at Our Lady of Sorrows Parish. Kindly keep Don and his family in your thoughts and prayers during this difficult time.